Put our expertise to work for you. 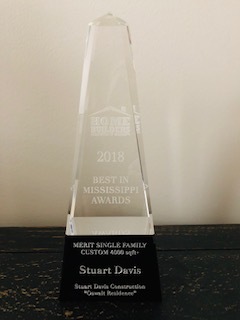 At Stuart Davis Construction, we are proud to have received the following recognition for our contributions to the Starkville community. We realize that this could be the largest investment of your life and we take that to heart. We would be honored to work for you and make your dream home a reality! "When we came to Starkville, we walked through many homes. We could tell the difference in quality when looking at a home that Stuart Davis built. We knew that is what we wanted." "Thank all of you for your efforts! Each of you have blessed our lives with considerable care and attention that you have shown in keeping us in the loop as our home is being built." "Stuart is the best contractor in Bulldog Country! This is the best built home and my most favorite home I have ever lived in."